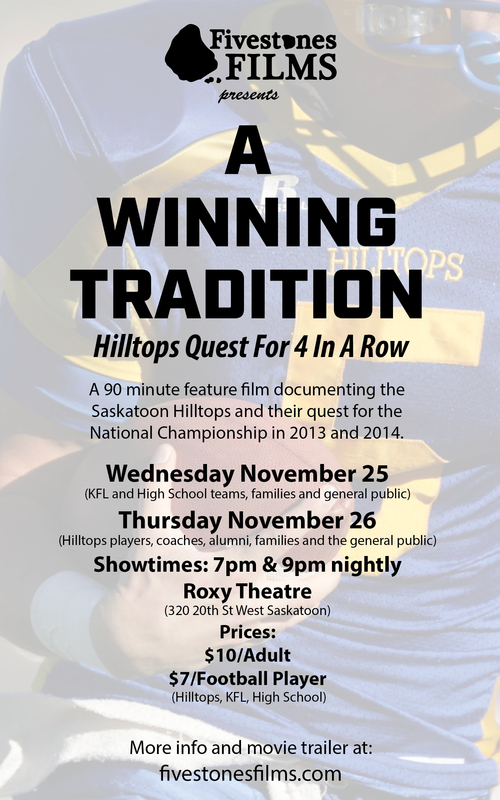 FiveStonesFILMS has been following the Saskatoon Hilltops football team from January 2013 to November 2014; our new documentary, “A Winning Tradition: Hilltops Quest For 4 In A Row”, will be debuting at the Roxy Theatre on November 25th and 26th (7 & 9pm nightly). We filmed the team and their quest to win an unprecedented fourth consecutive national title. The story evolved from “Rush 4 Four” to focus on the team, their triumphs/struggles and how the head coach (Tom Sergeant) continues to inspire his players and coaching staff. Check out the first two trailers with the official movie trailer coming soon.